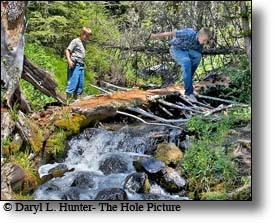 Hikers enjoying the all the sights of northeast Yellowstone's back country. This serene and beautiful lake is accessible via a short hike through the forest. It is a steep 1/2-mile trail through a Douglas fir forest leads to the lake. 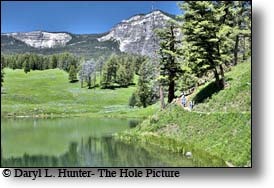 Trout lake sits in a depression on a high bench above the Soda Butte Creek Canyon south of Cooke City. 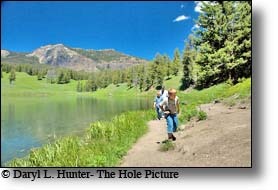 Formerly known as Fish Lake and Soda Butte Lake this 12-acre gem is a popular backcountry lake for hikers and anglers. Upon reaching the lake you can take a nice easy walk around it with great views in every direction. 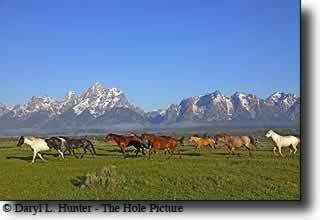 Mount Hornaday is seen behind the lake and in spring to early summer will sometimes have a waterfall on the side. 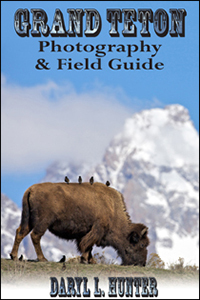 10,003 foot Mount Hornaday was named in 1938 for naturalist William Temple Hornaday, a former director of the New York Zoological Gardens who championed the cause of saving the American Bison from extinction. 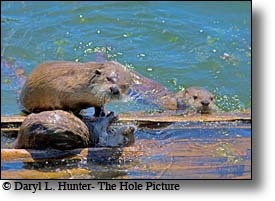 A River Otter Family takes in a little sun between fishing expeditions into Trout Lake. Many River Otters frequent the lake that are quite used to people making them very easy to photograph and observe. 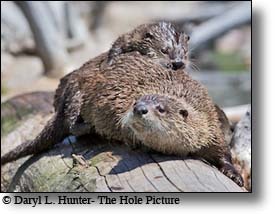 Otters are known for their playfulness, exhibiting behaviors such as mud/snow sliding, burrowing through the snow, and water play. Many "play" activities actually serve a purpose. Some are used to strengthen social bonds, to practice hunting techniques, and to scent mark. North American river otters get their boundless energy from their very high metabolism, which also requires them to eat a great deal during the day. 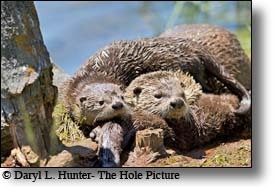 Trout Lake’s otters may be a bigger reason for the popularity of the lake than the fishing. 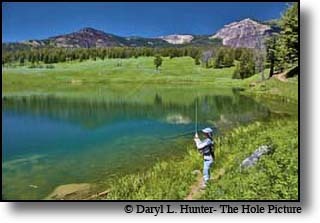 Trout Lake has always been popular with anglers for its large (14-20") Cutthroat trout and very large (20-30") Rainbow trout and Rainbow/Cutthroat Hybrids. In the early days of Yellowstone, Trout Lake was used as a fish hatchery to transplant fish to other parts of the park. There is a small wooden bridge over the inlet of the lake. In early summer you will see trout spawning here. The lake can be easily fished from the shoreline, however, many fishermen use float tubes to access the deeper parts of the lake. Using a float tube on Yellowstone lakes requires a park service boating permit. 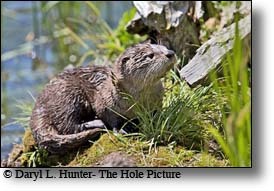 The lake opens for fishing in mid June, but a section of the lake near the inlet stream is closed until mid-July to protect spawning Cutthroat trout, but the otters can’t read the sign. 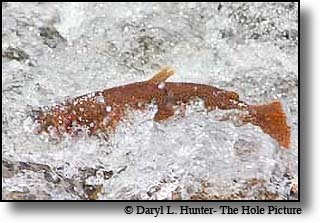 All Cutthroat trout and Cutthroat/Rainbow hybrids caught in Trout Lake must be released. 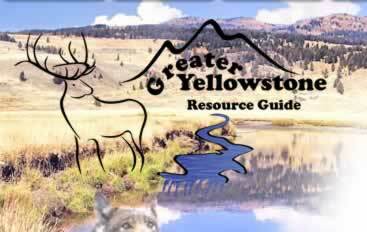 Fishing permits are required at Yellowstone Park and can be purchased at all park ranger stations, visitor centers, or Yellowstone Park General Stores. All adults and kids 16 and up are required to purchase a $15 three-day permit, a $20 seven-day permit or a $35 season permit. Children under 15 may fish without a permit if they are fishing under the direct supervision of an adult who has a valid park fishing permit, or they can obtain a free permit signed by a responsible adult; with this permit, a child can fish without direct adult supervision.